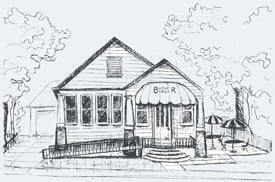 THE STORY - The tale of the Burger-Burger is yet another example of the colorful history of Biloxi, Mississippi. The Burger-Burger is a unique sandwich brought to Biloxi in 1947 by Abbie and Mildred Brunies of New Orleans. It was sold in a small diner on Benachi Avenue for many years, and quickly became a local favorite. Martha Ann Ebberman, a Biloxi native and frequent customer, bought the diner and the trademark recipe from the Brunies in 1987. She kept the diner open until 1993, when she began serving Burger Burgers at an Ocean Springs restaurant. During that time, she waited for the perfect property to become available for re-locating Burger Burger. A conversation between Ebberman and Biloxi businessman Jamie Sablich led to a grand re-opening of Burger Burger on Howard Ave. in Biloxi in January of 2001. The reviews thus far have been complimentary, and the food is creating an army of loyal customers. Come see what all the fuss is about.